The people wanted it. The press wanted it. The engineers wanted to make it. And in 2006, General Motors finally delivered the American-built Mazda MX-5 competitor that was so missing from its domestic line up. 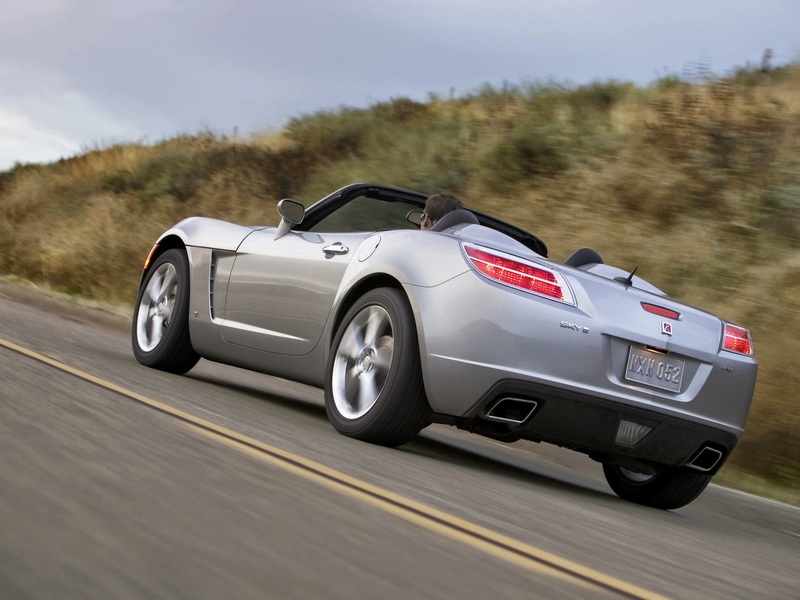 The Skystice (Pontiac Solstice and Saturn Sky) was instantly loved by the people (7,000 orders in first 10 days), the press, and everyone who longed for an inexpensive US built open air roadster. It was extremely successful in SCCA club racing, where it swept the podium in Touring 2 class in 2007, 2008, & 2009. Unfortunately, the choirs of angels singing halleluiah were rudely interrupted by the automotive market crisis of 2008, and in 2010 GM closed the doors on the Wilmington, Delware assembly plant. The sun had set on cheap American roadster, but prices for a used example of the Skystice couldn't be better today. GM's Kappa platform used was a mixed breed of components from the GM parts room --Rear axle and diff from the Sigma-based Cadillac CTS; Steering wheel is from the Delta-based Pontiac G5, Passenger-side airbag, steering column, and door handles from the Cobalt; backup lights are from the GMC Envoy; HVAC parts are from the Hummer; 2.4 L Ecotec engine was shared with the Saturn Ion, Pontiac G6, Chevrolet Cobalt, Pontiac G5, and Chevrolet HHR; The 5-speed manual gearbox was also used on Hummer H3, GMC Canyon, and Chevrolet Colorado. This was a grab bag extraordinaire, but don't think you need all new bespoke parts to make a great car -- the GXP/Redline models are fast and fun for the bucks. Let's take a look at what we can get with our greenbacks on eBay. 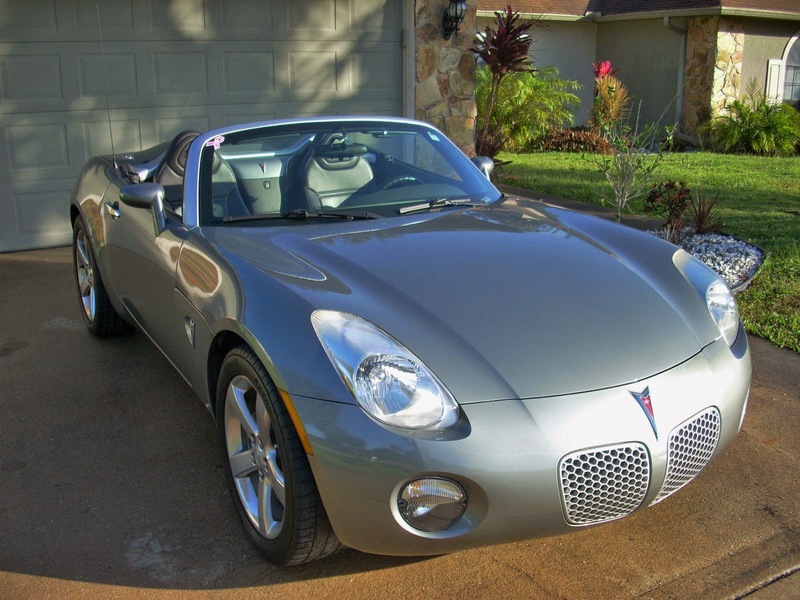 First up is this 2007 Pontiac Solstice GXP 5-speed offered for $12,750 buy-it-now or make offer, here on eBay , located in Fort Myers FL. The GXP badge means it has the 2.0 liter turbocharged direct injected Ecotec LNF inline-4 putting out 260 horsepower and 260 ft-lbs of torque mated to a 5-speed manual and a standard limited slip differential out back. This translates to a car that hits 60 mph in around 5 seconds, but performance can be improved with an aftermarket (or GM supplied) ECU chip. If you find the mesh Pontiac nostgrill to be unpleasing, then the Franz von Holzhausen designed Saturn Sky might be more to your liking. Actually, Franz was part of the design team for both cars, but the Sky had a look similar to the Opel Speedster that it replaced (badged as the Opel GT) for the European market. 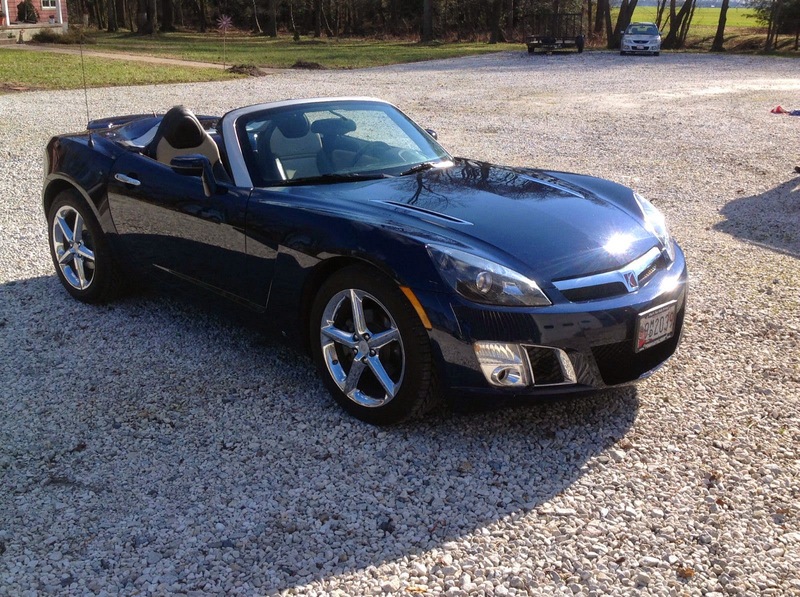 This 2008 Saturn Sky Redline 5-speed is currently bidding for $12,016 reserve-not-met here on eBay with a few days to go, located in Hurlock, MD. Performance and handling of the Redline version will be equal to the GXP version, but half as many Skys were built as Solstices. This next Solstice is a special version that Pontiac called the T2 Championship Edition to commemorate their victories in SCCA club racing. 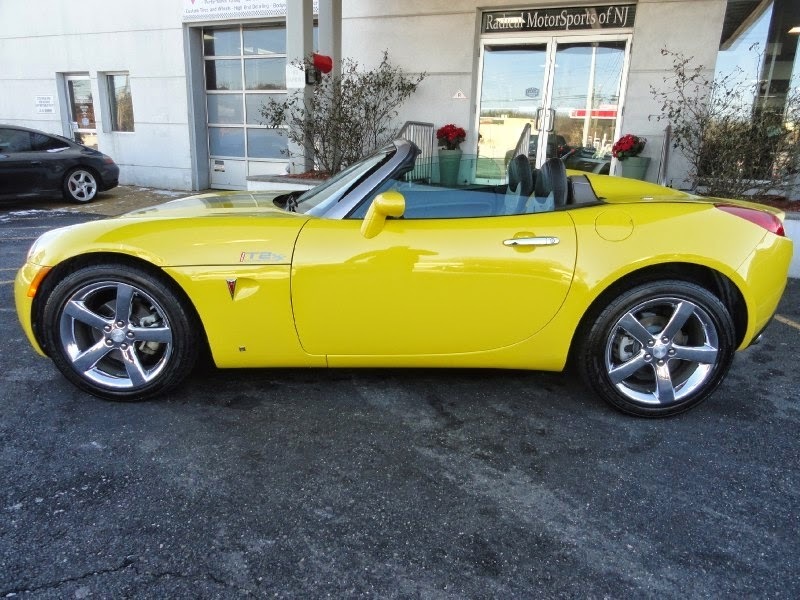 This 2008 Pontiac Solstice SCCA T2 Champion Edition 5-speed is currently bidding for $6,400 reserve-not-met here on eBay , located in Ramsey, NJ with 3 days to go. According to various internet sources, the total production of the T2 GXP is under 100 cars (some say 88, others 90), but it was only available for 2008, all were yellow with light grey stripping on hood and on trunk, T2 stripe/badge on sides of hood, and had T2 SCCA Champion stitching on the two-tone seats to replace the standard GXP script. If you are not a big fan of forced induction, you could pickup this 2006 Pontiac Solstice Club Sport 5-speed currently bidding for $9,000 with $11,000 buy-it-now here on eBay , located in Palm Bay, FL with 1 day to go. The 2.4 liter Ecotec LE5 inline-4 produces 177 horsepower and 173 ft-lbs of torque. This particular Solstice was ordered when new with Z0K-Club Sport Package, which added JL9-Brakes antilock brakes, G80 limited slip differential, and FE3 sport-tuned suspension. If you were going autocrossing in stock class, this was the responsive throttle version you'd want to shod with Hoosiers, install crash bolts for maximum camber, and then race. If you are willing to deal with the frustrations of driving fast in a slushbox equipped car (or really like color blue) this next Saturn Sky Redline seems like a decent deal. Find this 2007 Saturn Sky Redline automatic here on eBay currently bidding for $5,988 with less than one day to go, located in Hollywood, FL. The 5-speed GM 5L40-E automatic transmission can be shifted via steering wheel mounted buttons...but its no DSG. Lastly, there is a dealer in Texas who has a few low mile Skys for sale that don't look too bad. He has enough of them that he'll probably be keen on dumping them before he gets enough on his rooftop garage that the sky falls in on him. Texas Direct Auto has a 2007 Saturn Sky 5-speed for $13,980, a 2008 Saturn Sky Auto for $15,980 and a 2009 Saturn Sky Redline Auto for $16,780. Prices are a bit steep, but miles are low and the fact that the seller has 3 of them is interesting. Texas direct is not a good source to buy from, so be sure to check for previous damage. Neat cars. I'd love to give the Coupe a try and it's too bad the GXP-R never made it into production. And surely that T2 Champion edition will be a collectible someday. I've never really studied these cars before, so this post is very interesting and thank-you for it. I've come to the conclusion that I like the "mesh" front of the Pontiac Solstice, to that of the Saturn Sky. If you can deal with the colour, the 2008 Pontiac SCCA T2 Champion Edition, as someone else said looks like a future collectible, it will be interesting to see what it sell's for. I like it! I like this, too. I never said I was sane. I'm aware that the Miata only exists in LaLa Land. 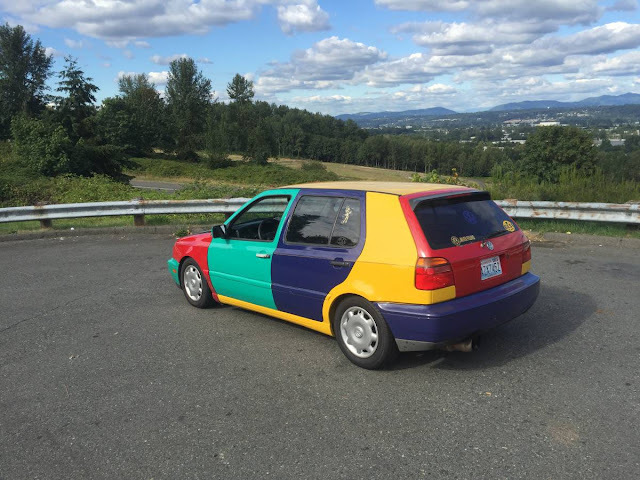 I only recently discovered that they made a coupe. It looks like an American Z4. I have seen several low mileage Mallet V8 versions sell at a very reasonable price this past summer. I say a low mileage stick-shift Mallet V8 for under $30K or a GPX/Redline for under $20K is an awesome value. I love the low volume Coupe but it seems that most of them are non-turbo with an automatic. What's with that! I am sure someone at GM marketing snuck that around Bob Lutz.